Sean Duffy from reality TV to Congress: Is the Wisconsin conservative the GOP’s next political star? Is Rep. Sean Duffy, a former reality TV star, Wisconsin’s next big star of conservative politics? 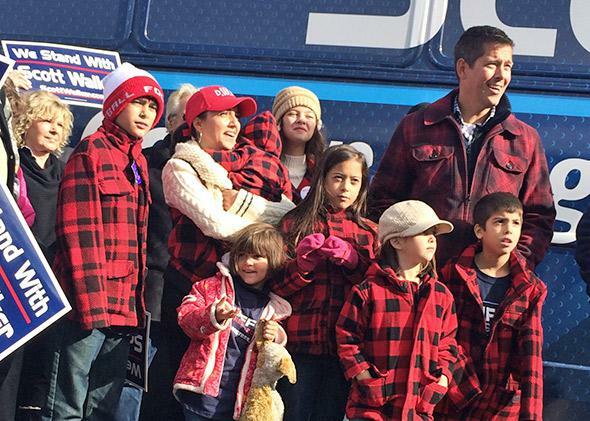 Sean Duffy and his family campaigning this weekend. RICE LAKE, Wisconsin—A Sean Duffy campaign stop is a sight to behold. The Wisconsin Republican trucks around his district with his wife, Rachel Campos-Duffy, and their seven kids (ages 6 months to 15 years) as well as their campaign staff. There’s a very high child-to-staffer ratio. One of the young girls always totes her stuffed dog, Ra-Ra, and the whole family, including the 6-month-old, sports black-and-red plaid. It’s all very on-brand, as Duffy was a lumberjack in another life. No child has yet been left behind at an event. Duffy has one of the more interesting résumés in Congress. As well as lumberjacking and working as a bus driver for a year in the ski town of Breckenridge, Colorado, he was a cast member on The Real World: Boston and Road Rules: All Stars, where he and his wife met. Though his national name recognition is probably lower now than during the zenith of his MTV days, he has fans in higher places. If anyone can parlay reality television celebrity into genuine public policy clout—and this would be a big if—it’s Duffy. More than 34,000 people have competed on reality shows in the United States since 2005, according to author Seth Kaufman, but Duffy is the only one you will find on the Hill. American idol alum Clay Aiken is facing Rep. Renee Ellmers in North Carolina, but that candidacy seems to be going nowhere. And though Duck Dynasty relative Zach Dasher is running in Louisiana against “Kissing Congressman” Vance McAllister, he wouldn’t technically count since he isn’t listed as a cast member. So unless Bristol Palin, Donald Trump, or a Kardashian decide to bless America by running for Congress sometime soon, Duffy is it. And the fact that a substantial portion of his 20s is on video doesn’t seem to have limited his political ambitions (which should be comforting to young Facebook users everywhere). In fact, it seems to be a net plus. Fellow Wisconsinite and Republican National Committee Chairman Reince Priebus thinks he’s a rising star for the party. And Wisconsin Republicans see him as a potential contender for statewide office; he’s a key member of their farm team. Duffy’s most immediate goal is to get re-elected on Tuesday. His district, which takes up much of the northern half of the state, is the geographically largest in Wisconsin, and it’s a swing district. President Obama won it by eight points in 2008, and Mitt Romney won by a few in 2012. Duffy’s team doesn’t seemed worried about re-election, and the Cook Political Report rates the race as “solid Republican,” but Duffy still campaigns hard and goes back to the district every weekend. After the Eau Claire rally, “the future of America” and his brood headed to a restaurant called The Bog in Warrens, where Rachel and the 6-month-old were immediately swarmed by middle-aged women. Then it was on to the final stop of the day, a meeting with volunteers at the Barron County GOP headquarters in Rice Lake, Wisconsin. There, they meet up with Rep. Jim Sensenbrenner, the dean of the Wisconsin delegation and another big Duffy booster. Over dinner at a nearby supper club, Sensenbrenner explained that his relationship with the Duffy family goes deeper than just politics. Duffy and Rep. Paul Ryan are close—both are practicing Catholics, and their kids have slumber parties together—and they played an outsized role in Sensenbrenner’s recent conversion to Catholicism. Sensenbrenner, then Anglican, faced a personal crisis in May. Timothy Dolan, currently Archbishop of New York, was previously Archbishop of Milwaukee, so his diocese and Sensenbrenner’s congressional distract overlapped. Duffy laughs at the “loving their neighbor” comment. Duffy didn’t go into explicit detail, but the gist is this: He and Ryan communicated to the right people that Dolan ought to call Sensenbrenner about his wife’s health issues and, maybe, about crossing the Tiber. “Perhaps ‘amenable,’ ” says Rachel. Dolan came to Milwaukee in August to confirm Sensenbrenner into the Catholic Church. The Duffys attended the ceremony. “Ever since they convinced me to become Catholic, I’ve become very warm and cuddly,” Sensenbrenner deadpans. After Election Day, expect the Republican Party to call on Duffy to use his powers of persuasion for a far larger audience.